This beautifully designed American made Dog's Head folding pocket knife has been created with a full 3" D2 steel blade graded with a hardness rating of 56-58. The blade has been flat ground to provide longer edge retention. This knife offers a smooth slip-joint opening with a secure lockback lock safety system to protect against accidental closure while in use.The handles of this Coppersmith knife are made from real bone giving the knife a deep rich appearance and smooth grip in the hand. 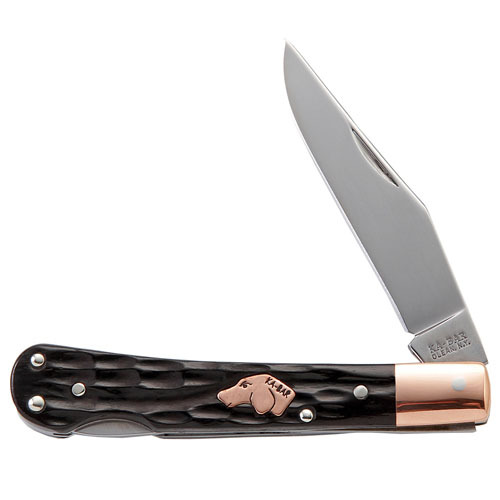 The knife bolsters, as well as the famous Dog's Head shield, were created with polished copper.